VILEDA is one of the world’s leading household and cleaning product manufacturers. 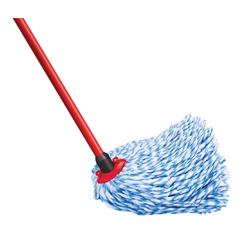 The German-based firm has a huge array of products available, covering all manner of cleaning needs, from mops and dustpans to cleaning sprays and cloths. It doesn’t matter which room of the house you are cleaning - Vileda will have a product for the job. And as one of the most recognisable household brands on the globe, you can be assured of high quality. Not a company to stand on their laurels, it prides itself on being an innovator in the cleaning industry, constantly developing its offering to customers. Whether it's speeding up the nagging cleaning chores or using the latest technology to cut through dirt and grime, Vileda is always trying to improve its range. Its leading innovations, such as microfiber technology or chemical make-up are see as the standard bearer which others aspire to. As well as being a leading consumer brand, Vileda also provides cleaning products on an industrial scale to businesses, ensuring Vileda-quality cleanliness commercially as well as privately. Being a trusted leader in cleaning products means you are getting the very best of the market when you buy Vileda products from us.